Hostel of the Sun is in an excellent location overlooking the bay and is just 10 minutes' walk from Piazza Trieste e Trento and the Galleria di Palazzo Zevallo Stigliano. In fact, it's an easy walk to all of the historic centre of Naples. 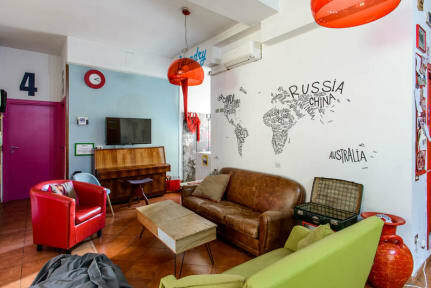 This hostel features a wide range of private rooms and dorms and Hostelworld guests have compared it favourably to a hotel. We like that the friendly staff have great suggestions for local restaurants and sights off the beaten track. This is probably the best hostel I've ever stayed in!! The staff were so friendly and the hostel was very clean. The vibe was amazing and the facilities were good quality. Very impressed by how comfortable the bed was. Loved it!! Walking distance to everywhere. Very clean. Props to the staff. They were all super helpful, super friendly, super people. Amazing! This hostel is everything a hostel should be. The staff is incredibly warm and welcoming. Sabrina (if I remember her name correctly) helped us plan a perfect day trip to Amalfi, and recommended amazing, lesser-known food spots. The locations is great for walking to the lovely Spanish quarter and seaside area. This hostel made me love Naples, I HIGHLY recommend! One of the friendliest hostels I've ever stayed in. The girls working the front desk when I arrived were so nice, gave us all the advice we needed for our stay, and remembered my name when I checked out. The common spaces are very cozy and each night people are chatting and drinking until the bar closes (early enough so others can sleep). Very homey and cozy, and the most comfortable hostel bed I've slept in! Wonderful staff, spacious rooms with storage. The breakfast was a nice perk, and they keep refilling things throughout the morning so you don’t have to be the first one to arrive out of fear of no food being left. Would recommend! The success of this place is down to the two lovely staff members who are always cheerful, helpful and seem to remember everyone's name, where they are from and their holiday plans. Incredible girls. Location is good in that it’s near the port and central to stuff you’d want to do in Naples - otherwise it’s in between an alley that’s a bit sketchy. The two women working the front desk were very helpful and nice but the guy working at the front was quite unhelpful. It is a safe place and clean so for a hostel you can’t really ask for much better. A bit more of a casual, grungy vibe that might not be best for everyone. Overall it was a fine place to stay. Here at Hostel of the Sun we\'ve come up with a load of original ways to see the sights around the area. Bored of walking tours? We\'ll get you on a horse up Vesuvius, in a kayak around the Bay of Naples and eating Sfogliatella and drinking coffee with the locals! Back at the hostel everything is included in the price you see online - Wi-Fi, computers, linen and breakfast - so there are no hidden costs when you arrive here! I think we set ourselves apart by offering great customer service. Actually, we just care about our guests. Whether it\'s helping them save money, getting somewhere in the quickest way or even doing their washing for them, we\'ll really try our best to help them out with anything. We\'re located exactly in the centre of Naples, a short tram ride from the station (â'¬1.20), 10 minutes\' walking distance to the old town, two minutes from the main square and the shopping areas. But most importantly we are fantastically located for all the day trips that our guests can do around the area - we are about two minutes\' walk from the port where boats go to Capri and the other islands, seconds from public transport to Pompeii and the Amalfi Coast. As for my personal favourite, there are so many things to visit in the area that it\'s hard to choose! I suppose it has to be Pompeii though. The levels of preservation of these ruins are just incredible, and there\'s no way you can come to Italy without taking a day to roam the streets of this ancient Roman city. We\'ve seen a big change in the age group of people staying at the hostel. A larger range of ages have realised the advantages of staying in hostels rather than budget hotels, from meeting other travellers to getting the best local advice from the experts - us! Too many hotels hand you the keys to your room and say \'ciao\' but this isn\'t our style. Whether you\'ve got five days or five hours in our city we\'ll help you make the most of it.